With its scenic mountain-meets-beaches landscape and clement weather, Cape Town is one of the world’s most beautiful cities. Add in vibrant dining and art scenes, wildlife adventure and a genuinely welcoming atmosphere and you have all the ingredients for an amazing Chinese New Year holiday. 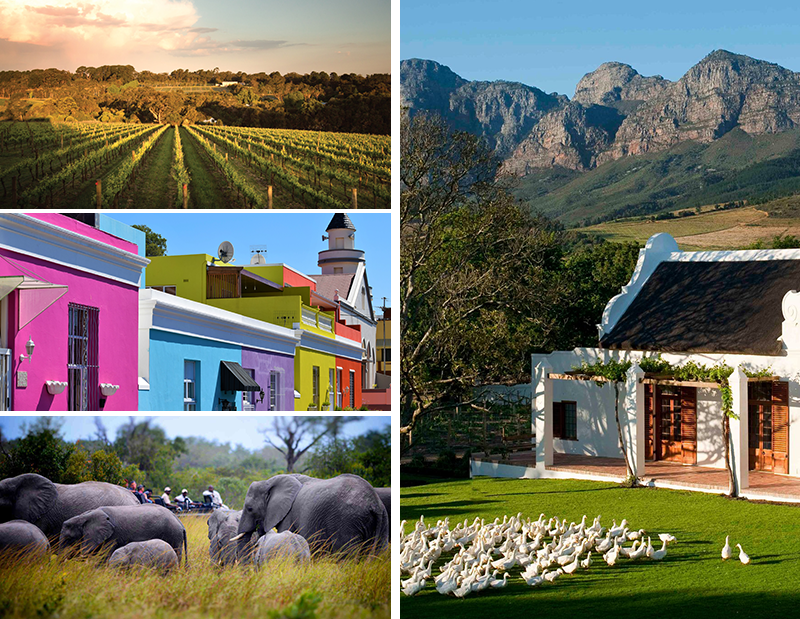 Personally hosted by LUXE CEO Simon Westcott and curated specifically for Connexus Travel, this five-day tour provides unique access to Cape Town’s trailblazing restaurateurs, winemakers, gallerists and adventure scouts. The trip will take place 5-11 February 2019 with an optional luxury safari extension to Sabi Sands Game Reserve. Morning: Transfer to Babylonstoren - Dating back to the 17th century, this ravishing Cape Dutch farm estate and spa is a ‘little Eden’, famed for its beautiful gardens and well-preserved vineyards. Lunch: Enjoy a hosted amble around Babylonstoren’s magnificent 8-acre garden, followed by a relaxed lunch. Afternoon: Private Experiences at Babylonstoren Estate - Sample the Babylonstoren winery’s finest drops, indulge in a spa session, browse the shop or, simply relax. Dinner: Le Petit Colombe in Franschhoek: Younger sibling to the outstanding La Colombe, and winner of ‘Best Hotel Restaurant’ at the Condé Nast Hotel & Garden Gourmet Awards 2017, this elegant fine-diner serves flavoursome French-Asian fare. Morning: Private Winelands tour - Boutique wine producer and founder of Greatest Africa Wine Tours Richard Hilton will lead you by the hand around some of the Cape’s finest, and most historic wineries. Lunch: Meerlust Estate: winery tour, tasting and lunch - One of South Africa’s oldest estates, Meerlust has been owned by the Myburgh family since 1756. They will host you on a private winery tour, tasting and lunch at the homestead, not usually open to the public. Afternoon: Private Winelands tour - Richard will continue the tour to Stellenbosch and Franschhoek with a pitstop at the Dylan Lewis Sculpture Garden. Dinner: Babel - Dine on seasonal, garden-fresh produce at Babylonstoren’s relaxed farm-to-table restaurant. Morning: Transfer to Belmond Mount Nelson Hotel - Perched at the foot of Table Mountain, pretty-in-pink Mount Nelson is Cape Town’s starriest heritage hotel, frequented by politicians, diplomats and celebrities since the early C20th. Cape Town Histories & Makers Tour - Art historian and Culture Connect founder Kate Crane Briggs will tell the kaleidoscopic story of Cape Town through its buildings, galleries and key cultural sights. Lunch: Private home in Bo-Kaap - Also known as the Malay Quarter, vibrant Bo-Kaap is Cape Town at its most multicultural. Kate will arrange a one-of-a-kind private kitchen experience not bookable elsewhere. Afternoon: Cape Town Histories & Makers tour - Kate’s tour continues, as you visit the studios, galleries and ateliers of the city’s creatives. Dinner: Greenhouse Restaurant, Beau Constantia - Considered one of the best restaurants in the country, occupying a top slot in 2017’s Mercedes-Benz Eat Out Awards, Greenhouse is a champion of modern, ingredient-led South African cuisine. Menus take you on a culinary journey of the fruits of the land and sea. Morning: Robben Island - After taking the public ferry over to the island, former warder and friend of Nelson Mandela, Christo Brand will lead you on a private tour around the prison. Lunch: Food restaurant - A light lunch at Food on the 6th floor of Zeitz MOCAA overlooking the water and the museum’s striking sculpture garden. Afternoon: Private tour of Zeitz MOCAA - The breathtaking Zeitz Museum of Contemporary Art Africa (Zeitz MOCAA) is ground zero for 21st-century art from Africa and its Diaspora. You’ll be treated to a private tour of the collection by the chief curator. Dinner: The Test Kitchen - Considered Cape Town’s first fine-dining restaurant and the only African entry in the World’s 50 Best Restaurants 2018, a sultry, neo-industrial dining room backdrops Luke Dale-Roberts’ tantalising around-the-world fare. Morning: Scenic helicopter flight - Camera-phones at the ready as you get high above the Cape, flying from V&A Waterfront to Cape Point. Lunch: Chef's Warehouse Beau Constantia VIP Box - Graze on seasonal, produce-driven plates with a side of verdant country views at this intimate winery kitchen in Constantia Valley. Afternoon: Private tour of Norval Foundation by Executive Director - This architectural, purpose-built gallery and research library set amid scenic gardens exhibits the Norval family’s impressive private collection of contemporary and modern South African art. You’ll be led on a private tour of the collection and sculpture garden. Dinner: Tintswalo Atlantic - Tucked between Table Mountain and the ocean, the superlative location and seafood-veering menu at this award-winning lodge are a fitting finale to the Cape Town adventure. Return flight to Hong Kong or extend your trip with an optional tour to Sabi Sands Game Reserve: This private game reserve near Kruger National Park is touted as the region’s best for spotting the Big 5 and is home to several luxury lodges. Should you wish to add Sabi Sands onto your trip, talk to your Connexus Travel consultant about a tailor-made safari experience. For more information, please download the brochure pdf here. To book, call Connexus on +852 3151 8892, or for more info please email InsiderCapeTown@luxecityguides.com and Simon will personally respond. Expenses incurred owing to the delay of air/land carriers that are beyond our control.